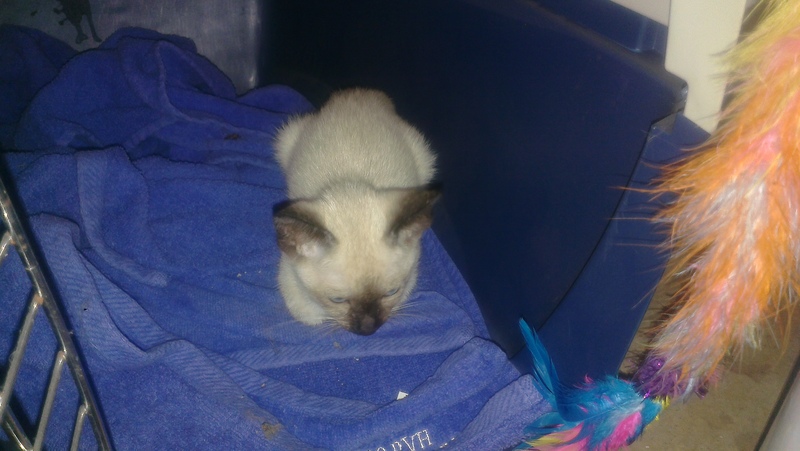 As those who follow me on Facebook know, our household has recently been the subject of a small fuzzy takeover in the form of an 11 week old Siamese kitten. And by recently I mean she arrived last Thursday evening and has spent the time since then wrapping me around her itty bitty paws. By Friday, she had earned the name Princess Buttercup, and she is as beautiful and demanding as her namesake (yes, our cats typically name themselves. This is why we have a cat named Bugger). In the course of a week, Her Little Highness has managed to get herself out of isolation aka kitty pokey aka the dungeon aka the back bathroom, explore the whole of the downstairs area, venture into the basement at least once, steal food from the bowls of the two adult cats (to be fair, Bugger is a wuss and Baby is about as laid-back as a cat can get while still being able to breathe), figure out that the human food is more interesting than the kitty food and try to steal mine, and make more noise in a day than the two boys usually make in weeks (again, to be fair, they both stopped talking because Her Fluffiness Shani who we lost to cancer in February had no voice and she was The Boss). She also swears. A lot. Then she looks up at me with the big blue eyes and I’m a goner. This is so much easier on the blood pressure than all the nonsense that’s been floating around lately, so enjoy. Oh, yes. Even more so in real life. Just too cute, but she does have a devilish look to her. Very much so. With emphatic reminders if the worship slackens. Rightful ownership has been established. Indeed it has. She has high standards of her humans. The best cats name themselves. A few years ago, Hubby brought home a pathetic scrap of skin, bones, and orange fur. It had a naked tail, and it’s feet were likewise missing fur. We were assured that this was a female cat, so my daughter promptly dubbed it “Princess Pumpkin”. The next morning, I needed to put the kitten in a travel kennel so I could drop her off at the vet for an exam. Damn cat sat under the exact center of the bed, and would not come out for love nor money. Tried calling it by name. No joy. Snacks? No interest. Various and sundry noises that have worked with every other cat I have ever met? Didn’t even blink. “Damn it, Piddlepot, I’m going to be late for work!”. The cat got up, walked over to me, and started purring. Thus, Princess Pumpkin became Piddlepot. Which is a good thing, as Princess Pumpkin is a ridiculous name for a male cat. I have GOT to remember not to read comments here when I have food/drink in my mouth. That one nearly cost me a keyboard. c4c Our dogs come pre-named. They’re pound puppies and they’re named there. With our dogs it depends. Mark was named by my Dad (we inherited him). Rose was a rescue, but un-named. Kleopatra was a puppy, and got her name because she was as beautiful as her namesake. My dog was pre-named. But she answers to anything I call her, and I come up with 1 or 2 new nicknames a day. Should write a story titled: “The 5000 Names of Dog”. One of our cats came prenamed. My sister had her the first eight months and called her Marissa. I didn’t like that name for her so it kind of became Misa through that baby talk thing everyone does to animals (don’t deny it…you know you do it lol) and it stuck. When you have a rescue dog, you usually want to change his name because he flinches from it. So Rocky became Rory, and Prudence became Rua. Nobody knew our other rescue dogs’ names, so Cormac and Liath’s names were just picked out. Maggie and Leo came with names and without traumatic baggage; we just bought them. Agreed, unless your dog is so stupid she makes congresscritter seem like intellectual giants, dogs can be renamed. Though sometimes the pound name works. our dog has no bad memories associated with his name. Didn’t have that problem with Rosie, but for the first six months we had her, she freaked out whenever a teenage boy held a stick. Teenage girl, adult man or woman, not problem. If she saw a teenage boy with stick, she went Librarian poo. Princess. Our cats tend to be named by who they tell us they are, and she was quite insistent. She’s now eight years old, and a wonderful, if temperamental beast. For some reason she’s decided to move to our bed for the last couple of weeks. My side of our bed. She gets quite upset when I move her so I can get into bed, and if I don’t beat her to it moves back to the same spot. And yes, she get’s along fine with Kleopatra, mostly because she’s the boss, and Kleopatra is the most submissive beagle you’ve ever seen. Princess Buttercup is beautiful — and it looks like a good name for her! 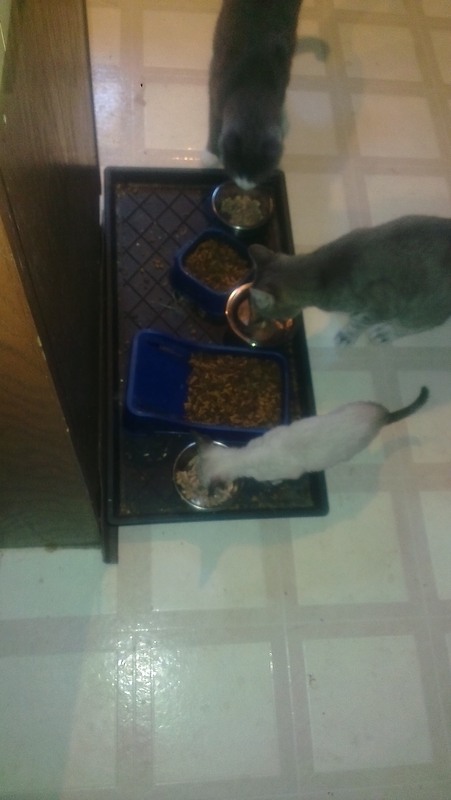 Siamese-colored cats are my favorites (please don’t tell that to Blue, our current cat! ), though I do prefer to have them crossed with domestic shorthair, as they are usually quieter with less of the Siamese temperament. I NEVER intended to have so many dogs, it just seemed to happen; they do all have work to do, though (or will have in Poppy’s case). I love every one of them, but I must say that Minto, the only purebred in the lot, is also the only one with any health problems — he has food allergies, and I have to either buy expensive food for him, or feed him people food (which he prefers anyway). Thankfully he’s the smallest of the lot and doesn’t eat much. Yes, pets tend to happen. In my case things don’t seem right without a Siamese-y kitty in the house, so Princess Buttercup was a deliberate addition. Gremlin got me wrapped around his paws. Took him about a year but he got me. Now I meow at him, curl up around him, and let him sleep on the bed till its time for us to go to bed. I do draw the line at kitty sleeping with us, but only cuz he gets up at 4 and wakes me up. 🙂 still, for someone who started out with no cat in bedroom, I’ve come a long way. Tell me about it. Athena the Cat keeps teaching me new tricks. And will continue to do so for as long as she’s around – they all do that. I’m right now having bit of a problem with my kitten (guy is now closing on 5 months). He figured out that my older cat is a wuss, and will always ran if he jumps on her. So he started a reign of terror. Which means I have to try and teach him some manners, the wuss doesn’t seem to have any inclinations towards that direction, she growls and hisses and occasionally swats with a paw, but she doesn’t do it in a serious enough way to scare him, maybe because he is still a kitten. Right now he is spending a lot of time in the pokey. I let him out and leave him out until he starts chasing the wuss. Right now that may take about 20 minutes, with luck. Then it’s back to pokey, if the water squirt and “NO!” don’t stop it. Most times they only slow him down for a few seconds, he doesn’t seem to mind water all that much. Accept that he’s a jerk? If there’s something he hates, and something he really wants you’re golden. Combine clicker training so you can encourage him when he’s coexisting peacefully with aversion training when he’s misbehaving. Consistency is key, but if you’re spotty it just takes longer. Yeah. The next months are going to be long ones. Let the CHORF beware! Kate the Impaler now possesses a rack mounted attack kitteh. With sharp itteh bitteh claws, self-propelled attack mode, and an eardrum-busting siren. Some ‘Impaler’ you are, gone all gooshy over a pretty little kitty. 🙂 Still, I know what you mean. Most of our cats over the years have been rescues and have named themselves. There was Ears (because she had fennec-proprtion ears, just HUGE), there was Bemini (whom I initially christened BEM, because as a kitten she was a Bug-Eyed-Monster), there was Othello, just as black and wily as the Moor himself, there was Joker, who was a prissy puss with NO sense of humour, there was Jennyanydots who was indeed a gumby cat. At the moment there is Max (Maximus Secundus, in formal situations, and like Maximus Primus, he is the Great Stealer of Chicken Thighs and a candidate for a manifestation of Basement Cat), and Angel, whom I think should be Bedroom Cat, but she won’t answer to it, dammit. My not-so-humble opinion, and worth what you paid for it, is that we all need a soft spot. We need to have times and places when we can tickle the kids, help the kitty hunt the Fierce Laser Dot, sprawl and not care that the Dog is slowly edging us off the couch – or simply acknowledge that the Dog has dibs, sometimes. I simultaneously feel sorry for and am more than a little nervous around people who can’t or won’t have a soft spot, be it kittehs, puppehs or das kinder. So Kate the Impaler has gone gooey over an itty bitty clawed, fanged alien intelligence that kills for fun–? Check in with my two top blogs today, and what do I find? Sarah taking a walk down memory lane, and Kate bonding with her new cat. Ah, many things can be excused by insufficient caffeine. 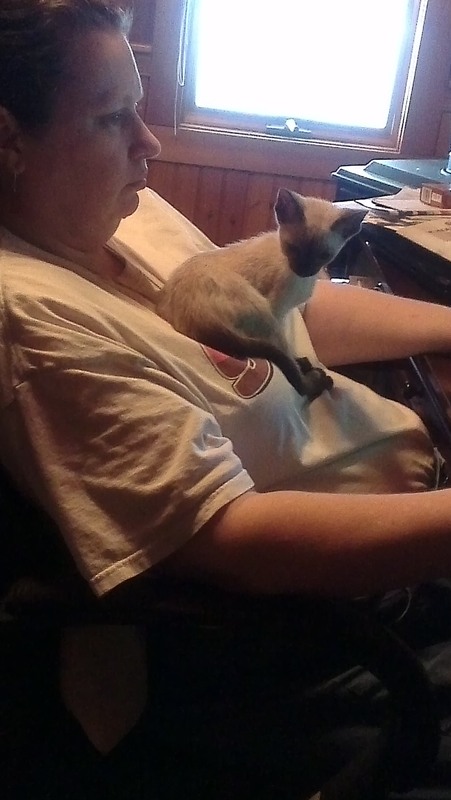 Had a part Siamese a few years ago. He was a great cat, but he had some strange issues. He once disappeared for half a year, then came back like nothing happened. He was very affectionate, but would draw serious blood if you tried to leave before he though you were finished. We have two labs. Blizzard has a lot of names, at least from me. She started out as Little Girl, then grew into Fair Princess, Warrior Princess, and Schnicklefritz, and reverts back to Little Girl every now and then, when she isn’t Quite the Lady. Lord Bear (we had all read Dies the Fire when he arrived) is just Bear. Usually. His other names are too embarrassing to repeat. Have you read the late Doreen Tovey’s brilliant books about living with Siamese cats? Cats in the Belfry, Cats in May. There are more. ROFLMAO funny, sometimes heartbreaking. Some of the best animal books ever written. In my house there’s Wilson the dog, Millie the dog, Oliver Queen the cat (he has a ginger hoodie), Madeleine the cat (Mads for short), Barney Miller the cat and Jezebel the cat. I had three cats most of the time I lived in Los Angeles. I named the first two Casserole and Potluck, since as a freelance writer it was reassuring to know there was a meal on hand, and the third was named BobbitCat after the tufts on its ears and an I suppose predicable incident in the bathroom. Potluck stayed with me for 21 years and only passed on after he got to see Texas for a year. Right now, we have Deb’s Los Angeles cat, the sinister black Java, and three rescues, one, Samantha the Siamese, that came with the property, one, Clarissa the Calico, that was literally at death’s door (laid down on the stoop and simply would not leave) and one that just walked up one day, looked at the door, looked at us and said, “Well?”, named Honeyboy for his golden orange color. They’ve been a godsend since the mice have started their fall invasion of the house… or tried to. The three rescues have launched a vigorous counterattack. Sammy, who was an outside cat longest as far as we can tell, is not a sharer; we just hear the crunchng sounds and I go around in the morning and collect the head or heads. (We seem to have three distinct mouse species on the property.) Honeyboy and Clarissa are far more generous and always share their prizes with us, usually at around three in the morning. I disagree with you in a great many ways, philosophically and literarily. But that is an *adorable* kitten. Well done.